Save $1 on Scotties facial tissue 6 pack or larger. Save $1 on Royale Velour bathroom tissue. Save $2 on Ruggermaid LunchBlox kit. save $5 on Bernardin canning kit. Save $1 on Vileda Scrunge sponge package. Save $0.75 on Royale 3 Ply Strong bathroom tissue. Save $0.75 on Royale Tiger Paper Towel 6 rolls pack. 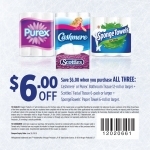 Save $1 on Purex or Cashmere Bathroom Tissue, Sponge Towels, or Scotties facial tissue. Save $1 on Scotties multi-pack facial tissue. Save $1 on Vileda product. Save $2 on Air Wick Pure product.